While sitting on her human’s bed, a funny little Scottish straight kitten named Mimo [see her Instagram account at the link] spotted a couple of floating triangles reflected in the dresser mirror just a few feet away. As Mimo got closer to investigate, she realized that those strange triangles were attached to her head as ears. To double check, Mimo reached up with her paw and struck a number of hilarious poses with her newly discovered pointy ears before scolding her human. This resembles the “self awareness” test that animal behaviorists use on creatures to see if they have a sense of self-identity. Researchers stick a red dot on the forehead of an animal like a chimp or an elephant, and then show it a mirror. If the animal tries to touch the sticker on its own head rather than play with the animal in the mirror, that supposedly shows that the animal realizes that the mirror is showing it a reflection of itself, and thus that the creature recognizes that the reflection is of itself. I don’t know if that test is universally accepted, but what Mimo is doing here resembles a self-awareness test that the cat passes when it touches its ears. I was over at the Law School last week, as its library is the only place where I could take out Hitchens’s The Trial of Henry Kissinger (a book well worth reading). 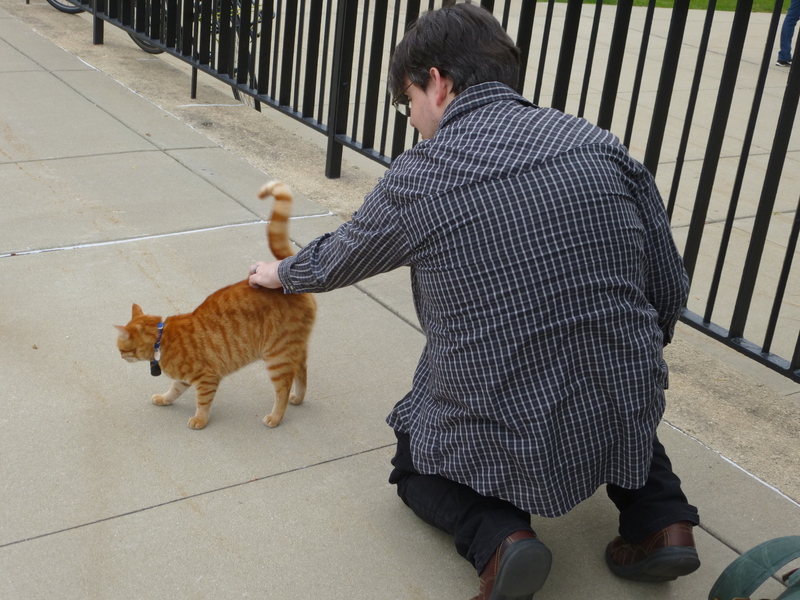 On the Law School Quad I came upon a friendly ginger cat with a tag and a barrel-like contraption on its collar. It was friendly, too, and tried to climb into my lap as I knelt down to pet it. One student passing by said, “Is that your cat?” I responded, no, it had just accosted me. Another student said that the cat was the most popular creature at the Law School. Looking at its tag, I saw that its name was Nestor (a great name! ), and the tag had a long message on it that I couldn’t read in detail as the cat was rubbing against me. But the message began with something like, “Hi, I’m Nestor, and I’m out having adventures. 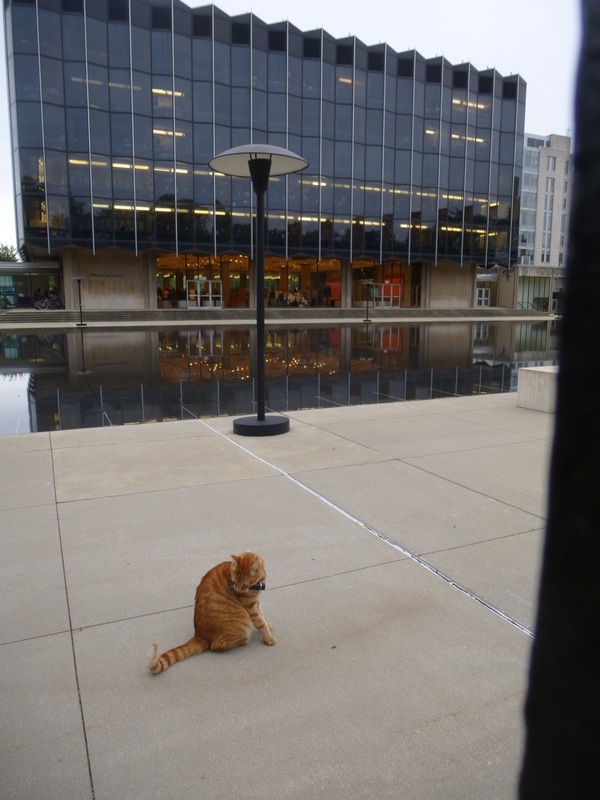 . . ” Clearly the cat is owned by someone and frequents the Law School campus. I have two questions. If you’re a law student or know about Nestor, could you tell me his story? Also, what is in that barrel around his neck? What’s in that plastic cylinder around Nestor’s neck? Mischief, who lives in New Zealand, has a cat door, and when people are around he scratches frantically at the door but won’t go through himself. He waits until someone shows up to open a real door. Mischief is, as we shall say, “a cat of size,” though he’s not obese (he’s been on a diet for years). He could get through the cat door if he wanted, but he prefers to have others let him in. How do we know? Because his owners sometimes find him inside when they’ve gone out, proving that he can and does use the door if nobody’s around. That means, of course, that he’s really lazy. But he’s a cat, and cats like servants. But it’s Mischief’s cat door antics that amuse McGregor and her family the most. This entry was written by whyevolutionistrue and posted on October 6, 2018 at 9:45 am and filed under Caturday felids. Bookmark the permalink. Follow any comments here with the RSS feed for this post. Both comments and trackbacks are currently closed. Should be: HEADLINE: Cat passes mirror test! Yep, it really looks like she’s recognizing herself in the mirror. Time to put something on her forehead and see what’ll happen. Nestor is probably carrying a gps locating device on its collar. There is one brand that looks like that, according to the internet. It’s curious the kitten investigates only one ear. I’d like to believe it’s smart enough to work out if one then so the other. That is a really small cat door. Ours isn’t much larger than that one appears to be and it is the largest available for cats – the next size up is styled as being for small dogs. The larger of our cats definitely squeezes through, though he is a big boy (mostly muscle: if you crouch down to stroke him he can easily push you off balance). I keep warning him of the consequences of getting bigger, though I doubt the ignominy of using a dog flap actually bothers him much. The cat door may be small, but Mischief has absolutely no problem using it, see the video at the bottom of this link https://www.thedodo.com/close-to-home/fat-cat-pretends-not-to-fit-cat-door. Mischef scratches and scratches at the door, and when no one comes, he pops right through it, despite his fat balls. Unfortunate concatenation of words. I didn’t mean testicles, but balls of stomach fat. And as Mark says above Nestor is wearing a GPS tracker. Specifically it’s a Pod3 GPS Tracker & Activity Monitor – it has the identical silver/white ring 1/3 of the way along the barrel. It will also send alerts to you phone should kitty step outside a preset zone. Thanks for finding that; that’s really cool! I’ve often thought about getting one of these for one of our cats as he wanders too far and is difficult to get in at night. (The other comes home like the good little cat he is.) It is a bit heavy to hang around a cat’s neck though perhaps that is not a problem. (I found out that it is 1.1 oz which is about as heavy as a standard staple remover.) I know that our cat would hate having something around his neck. Dogs recognize their own scent as different from others’ scents, but fail the mirror test. It is assumed this is because dogs are walking nose guided missiles who don’t respond much to visual input. Never do it for yourself if there’s some sucker who will do it for you. Also known as ‘the art of delegation’. I’m guessing that the cat prefers going through an open door to the cat flap because with the flap it can’t see what’s on the other side without making itself vulnerable. That Mischief is a really handsome tabby. Green eyes and an orange nose. We used to have a cat with that exact colouring decades ago (only ours was a skinny one, Mischief is reportedly fat). Rather prone to climbing the curtains, which was not a desirable habit.